Watch out! Daytime temperatures can get pretty toasty during the summer season for some regions! Summer is commonly marked as a season of outdoor fun, longer days, and a rise not only in recreational sporting activities, but temperatures as well! Humans are mammals, which means they regulate their own body temperatures pretty well, even in climates that could be considered colder or warmer than hospitable. However, even the most physically healthy human is vulnerable if exposed to extreme temperature conditions over prolonged periods of time, and around warmer regions of the Earth during summertime, heat-related illnesses can be a serious threat. What are heat-related illnesses, and why is awareness of them important, particularly in sports? Sometimes, the heat and vigor of exercise can distract you from the amount of water your body is really using! 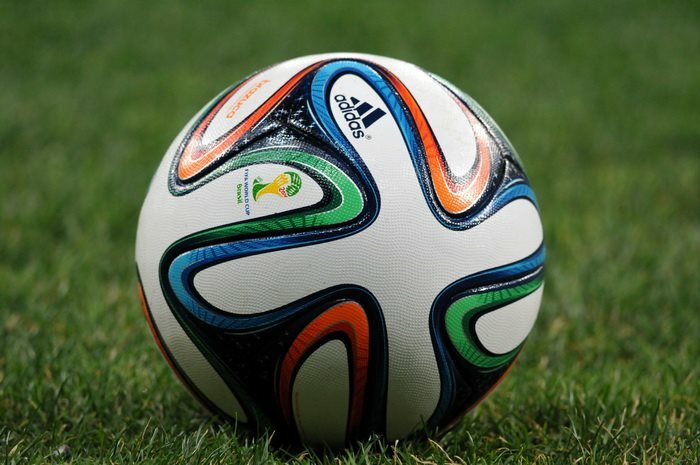 Be careful: due to occurrences like voluntary dehydration, you may be losing body fluids. Always drink plenty of water when exercising, even if you don’t feel thirsty! Up to 60% of the average human adult is comprised of water. It is a commonly-occurring liquid commonly considered by people as the healthiest drink available, and it is literally life-sustaining. Water is a vital component of human life, technically rivaling oxygen as the most important nutrient the body can receive, and its importance only increases in environments of strenuous physical activity (namely, sports)! Dehydration occurs when the body is not consuming as much water as it is using to power itself. Although it may take some time to fully manifest, if the body does not receive ample amounts of water in time, dehydration can be lethal. In hot environments, the body uses more water still to maintain individual cells and keep its overall temperature down. In summary, dehydration is much less of a threat for people while in a temperate environment in a resting state. However, when exercising (particularly in hot environments) and playing strenuous sports, be sure to consume plenty of water to avoid dehydration! 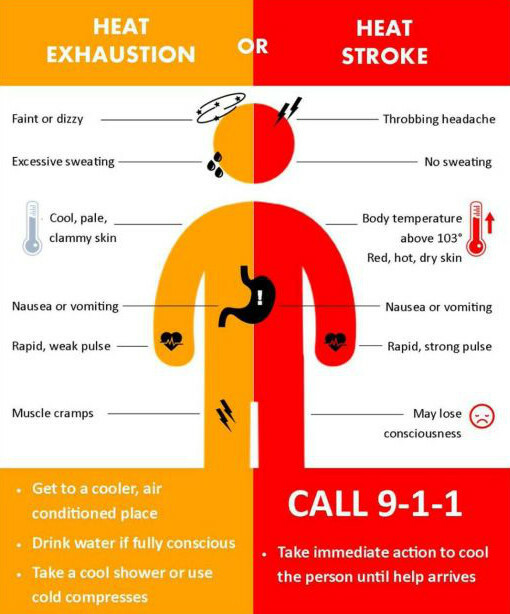 Here are some of the differences in symptoms and solutions for Heat Exhaustion and/or Heatstroke. Know what you’re dealing with, and how to get help if needed! Even a well-hydrated body is not guaranteed safe beneath the hot sun. Temperature regulation is an important component of sustained human life, but there is only so much the body can do if it is continuously exposed to high temperatures. 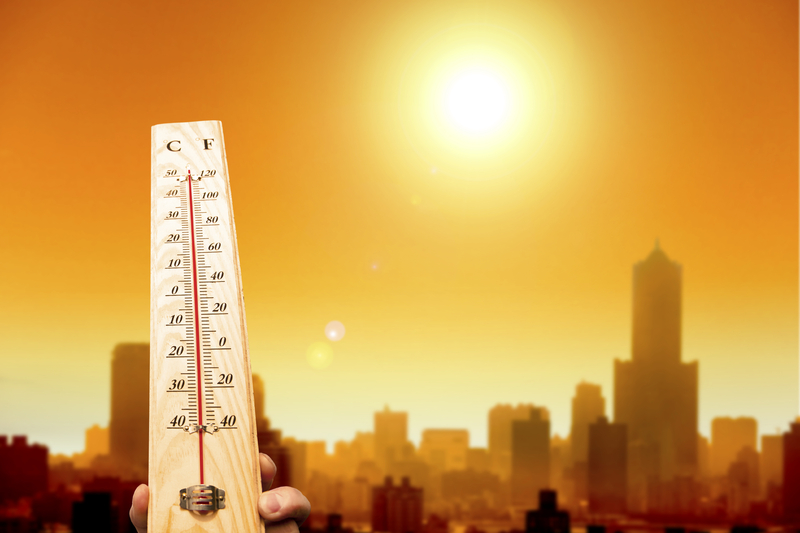 Two of the most dangerous side-effects of excessive heat exposure or overheating are heat exhaustion and heatstroke. Heat exhaustion often goes hand-in-hand with dehydration, and occurs when the body is exposed to high temperatures over a concentrated period of time. There are two major types of heat exhaustion; the first occurs when the body becomes depleted of water, while the second is related to salt deficiency. The most common cause of heat exhaustion (besides, naturally, the inhabitance of hot environments) is sweating, in which the body releases water and electrolytes to cool itself, but does not take in nutrients to replace what it has used. Heatstroke is known to follow heat exhaustion if symptoms persist, and can cause much more damage if not dealt with immediately. Considered a medical emergency, heatstroke is marked by dramatically increased body temperature combined with a distinctive lack of sweating. If the person afflicted is not immediately cooled off and rehydrated, brain damage, organ failure, and even death will occur. 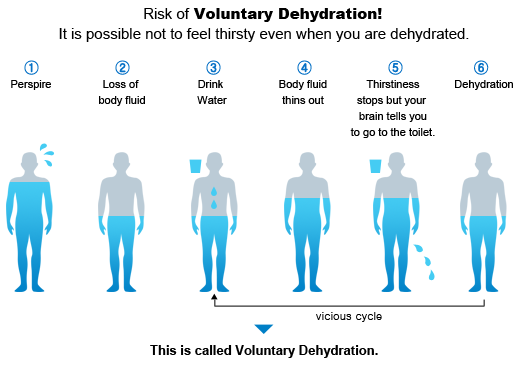 This entry was posted in Fitness/Wellness, Other and tagged dehydration, heat exhaustion, heat illnesses, heatstroke, safety in sports, safety tips, seasons, sport, sports, sports and fitness, sports and health, Sports Archives, sports performance, sports safety, summer season, summer sports, water sports. Bookmark the permalink.